I love this poem. I was trying to work on another assignment during my junior year of undergrad and instead chose to procrastinate with a little poetry. I was able, as is often not the case, to capture a sense of rhythm with this piece that I always admire in others’ work. 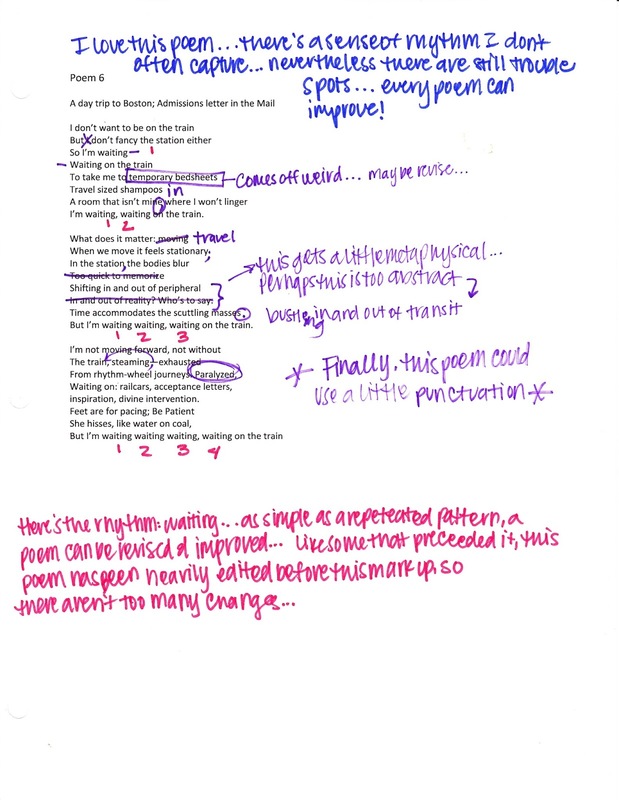 The use of repetition and structure carries throughout the poem in a positive way, while there are some minor elements that need attention. The mark-ups are surface level here. This poem has seen multiple rounds of revisions which included a whole restructuring in its earlier stages. My goal here is to fine tune the imagery and establish a sense of I as well as they in order to solidify the solidarity of the narrator. Like a story, some poems have characters that need to be distinguished. Often this notion goes unrevised because a poem is beyond that kind of artifice. Don’t be afraid to try new things like characters, plot elements or even scene shifts in your work. If it feels narrative in nature, don’t resist that, use it to your advantage. The abstract areas are those where the voice is lost to vague notions. These lines act as fillers for something more poignant. Bodies blurring, too quick to memorize implies little about the moment and at the same time generalizes the perspective of the narrator. Instead of those important poetic details that I mentioned last time, we get a blur that is too hard to memorize, which is also an abstract notion. Here would be a good place for some color, some sensation, a smell or a sound. The other stanzas bring that to the table, the second stanza seems to hit a lull. However, you will notice I am not trashing it all together because there is that rhythm and the structure to remember. A poem can always be edited. at any stage. Remember, in later drafts to distinguish the high and lows of a poem and methods of editing that doesn’t undercut the best part of a piece. In this case the missing sense of boundaries between speaker and environment helped me see where I needed to focus my attention. Step back and ask yourself if a later draft has hit a lull, and if so, where that lull might exist. Fine tune work is just as important as the big sweeping cuts you’ve seen me make before… every step of the way a poem can be tweaked… that’s my favorite part of poetry!